Ancient Egyptians, Greeks and Romans all used mustard to flavor meat and fish. They would mix crushed mustard grains in with their food to enhance its flavor. The early Romans also used mustard pastes that were similar to the prepared mustards that we use today. These pastes consisted of ground mustard mixed with wine. Mustard was also considered a medicine as well as a condiment. Sixth century scientist Pythagoras recommended mustard for treating scorpion stings. Charlemagne would encourage the spice’s cultivation throughout his realm. It would eventually spread to England and Spain as well as to India via Vasco de Gama’s ships. Jeremiah Colman of Colman’s Mustard fame would perfect a technique for grinding mustard seeds in 1866. This technique allowed for the seeds to be ground without bringing out their volatile oil thus preserving their flavor. 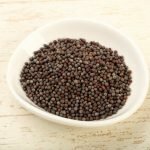 The different types of mustard seeds used to make mustard powder each share a pleasant pungency that makes the other flavors in a dish shine. There are three types of mustard seeds and each possesses its own flavor characteristics. White and yellow mustard seeds are usually larger than brown seeds but are not as pungent. Note that yellow Chinese mustard seeds are the exception here as they are particularly spicy. The main use for the brown mustard seeds is in pickling; they are often used in the brine for making corned beef. Brown mustard seeds are often used both in Indian cooking and for making mustards in Europe. Black mustard seeds are the most pungent but are also more expensive to grow and harvest. Essential oils: Mustard is high in essential oils and plant sterols. These include campesterol and stigmasterol. The spice is also rich in myrosin and sinigrin. 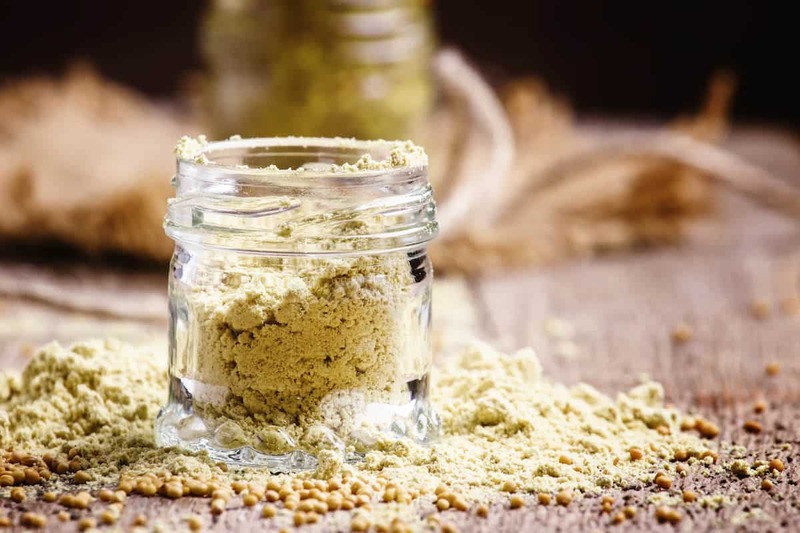 Antioxidants: Mustard powder contains antioxidants including carotenes and lutein along with vitamin antioxidants like vitamin K and C. Mustard also provides omega-3 fatty acids . Vitamins: Mustard contains high levels of folates, niacin and other B-complex vitamins. These help with the regulation of metabolism and with nervous system function. 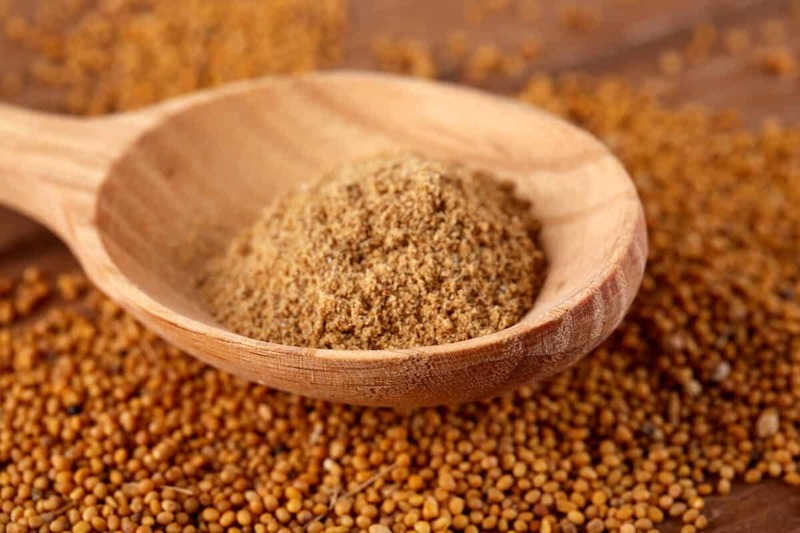 Minerals: Calcium, iron and zinc are among the minerals found in mustard seeds, some of them in high concentrations. They also contain selenium, which has been found useful for asthma prevention. A treatment for pains and spasms: Mustard has analgesic benefits and throughout history, poultices made from mustard have been used to treat pains. A poison antidote: Mustard seeds can work as an emetic that can help the body to deal with poison. It can be used to help get rid of toxins due to the intake of alcohol. A ringworm treatment: Mustard seeds can be used to cure ringworm lesions. Simply apply a paste of mustard powder and water to the affected skin and wash off with water. If mustard is not being added to a pickle brine, it should be fried for its flavor to be released. Mustard powder can be added to stir-fries at the start alongside ginger, garlic and other aromatics. Mustard also goes well with curries as it complements cumin, coriander, and fennel. Ground mustard’s usefulness is not limited to Asian cooking, it is also used in Italian cuisine where it is necessary for making mostardas. 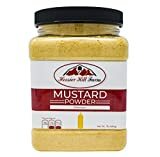 In the US, mustard powder is an important ingredient in salad dressings, soups and in dry rubs for meat. What's A Good Mustard Powder Substitute? 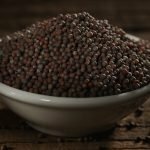 What's A Good Black Mustard Seed Substitute?